It’s likely that you’ve either been chastised or chastised someone for not sitting up straight enough. You may have wondered at these times why posture matters at all. 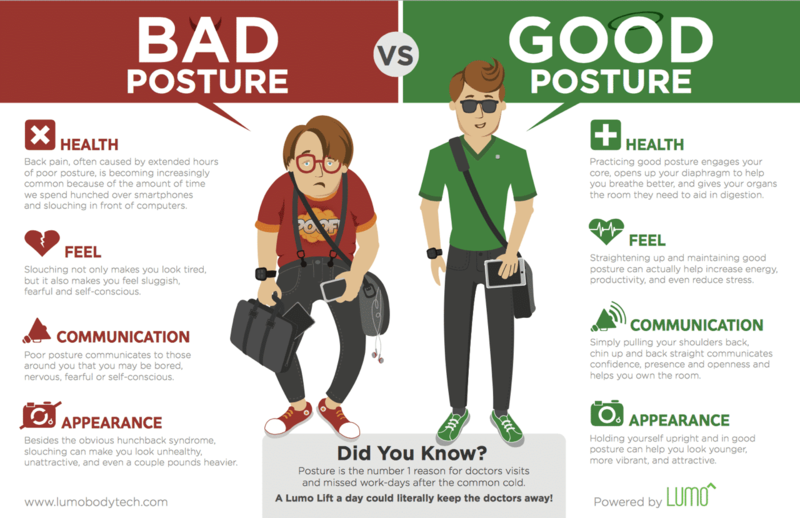 Improving your posture can improve a few aspects of your life. Singers already know that sitting or standing straight allows them to sing with more control. This is because it allows them to get more air through their diaphragm. If your sternum and rib cage are digging into your diaphragm, it will recruit the neck muscles to reduce the strain and make breathing easier. This in turn puts extra unnecessary strain on the neck muscles, making them sore and tense. It also is not an efficient way to breathe. Instead, it is better to keep your diaphragm open by sitting straighter to keep it from being compressed. Better posture can improve energy in a couple of ways. First, it improves your breathing. When your breathing is better it gets more oxygen flowing through your body to your muscles and brain. When your brain has enough oxygen, it won’t get stuck in that sluggish feeling that can hold us back from doing better on our work. Better posture can also help you conserve energy because you don’t have to expend it working muscles that aren’t necessary to keep your breathing in check. Additionally, better posture gives us better energy and concentration by tricking our minds. Just like people who smile through the pain report actually feeling better, sitting up straighter and better can help you believe that you have more energy. You can empower your mind and your body by choosing to sit with strong posture that enables you to have more control over your muscles and breathing. Posture not only affects the way we view ourselves, but also how others view us. When you are slouched over or sitting in a sloppy position, it tends to make you look like a sloppy person. However, people who sit up straight and strong look more authoritative and assertive. Not only is this a desirable quality in employees but also in potential spouse. If you find that you experience heartburn or constipation after eating lunch, your posture could be to blame. When you sit or stand in unnatural positions, it doesn’t allow your digestive system to work efficiently. Instead, the digestive process is slowed down and can cause discomfort. To combat this, work on your posture, particularly after meals, to help your body feel better and digest your food easier. To sit or stand with better posture, remember that you don’t need to be stick straight, as this is also an unnatural position that puts unnecessary strain on your back. Instead, remember that your spine has natural curves. When you sit or stand try to keep your weight balanced on both your left and right side so that your pelvis is working to support your spine. Good posture does not just rely on your back and spine, but on your entire body working together. If you’ve been experiencing back pain, lack of concentration, headaches, or poor digestion, a simple place to begin looking for solutions is your posture. Work on sitting or standing a little straighter. Keep reminders around your desk to be constantly working on your posture. Good posture is a gradual process; it doesn’t happen overnight. However, with diligence and concentration you can improve your posture and improve your life.